An undeniably classic crew-neck sweater made with the unparalleled comfort of blended merino wool, the Shifter Long Sleeve Crewe is the perfect pullover for travel adventures or relaxing after a long day outside. The Shifter features Icebreaker's super-comfortable, unbrushed terry merino fabric that features corespun fibers—nylon threads wrapped in merino wool for the ultimate combination of durability and next-to-skin softness. They also added a touch of stretchy Lycra® to help the Shifter move with you across the spectrum of daily motion. The pass through front pocket keeps your hands warm on chilly days. Shifter LS Crewe - Mens is rated 4.7 out of 5 by 10. Rated 5 out of 5 by rjohn82 from Possibly my new favorite sweatshirts I liked this sweater so much I decided to buy all the colors (and an extra navy one). It's a fantastic casual piece that if required you can also dress up a bit. The fabric is fantastic! (light enough for pretty much all conditions yet heavy enough that it drapes perfectly). While some have complained about the kangaroo pocket I think it's great. I own a number of Nike SW crews like this so was already used to it but Icebreaker found a way to make the pocket an almost seamless integration into the piece. I highly recommend this sweater! One caveat, I do feel they run a touch large (which was a good thing). I was prompted to purchase a size XXL but glad I didn't as the XL fit exactly how I wanted it to (just slightly loose). The Large would have been fine if I wanted a more fitted piece that I could wear a bit more dressed up (for reference I'm 6'3, 225 and an athletic/wide build). Rated 4 out of 5 by Min099 from Good shirt for all Amazing fabric, non-stink, regulates body temperature and looks good. Rated 4 out of 5 by Orland from Great sweatshirt This is a great hybrid sweatshirt. The fabric is great, and the cut is roomy (but in a good sweatshirt way). The medium size that I purchased is consistent with other similar brands. I didn’t notice the hoody style front pocket when I purchased it, but like this feature. I find the icebreaker clothing to be rather expensive, but most pieces are tough and end up lasting a long time. I am expecting this sweatshirt to serve me a long time. Rated 5 out of 5 by V8Notch from Love it - Get rid of the hand pocket Love this top. Great colour and great fit. I like the details on the neck stitching. Gives it a bit of character. Great for travel as it doesn’t hold onto smells. I have no need for the hand pocket. I think it would fit even better without it. Make a version without it and I’ll buy it! Rated 5 out of 5 by V8Notch from Great top Love the top. I’d like to see the hand pocket removed on future versions. Would make it raven cleaner. Rated 5 out of 5 by Jjulien from No regrets Super comfortable and it looks great! This has become a go to long sleeve for around town. 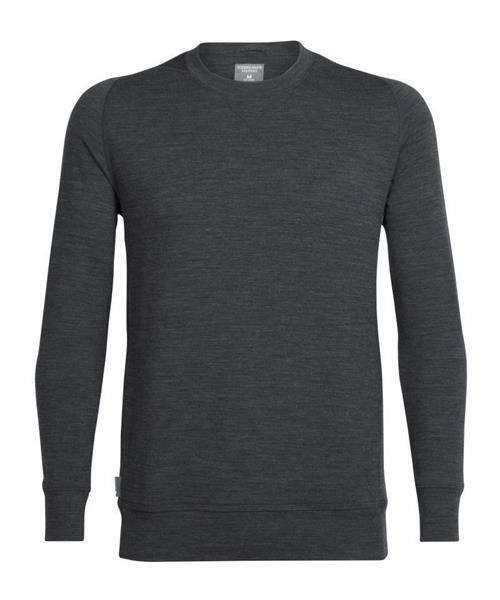 Rated 5 out of 5 by AltaIcebreaker from Great casual sweater Great sweater to wear wherever. Solid colours and well fitting. I expect to wear it year round as it will be great for cooler summer days and evenings as well as anytime rest of the year. Rated 5 out of 5 by Sojourner50 from Comfort and style, without a hood! As a comfortable garment that is half-way between a sweater and a sweatshirt, the shifter long sleeve crew has been perfect for my needs. Nice weight, and the same excellent quality we have come to expect from Icebreaker. I'm not a "hoody" guy, and had been looking for a sweatshirt that I could also wear to informal dinners. I wasn't all that excited with the front pouch, but find that I do stick my hands in it quite often (so it works). Overall; Excellent.